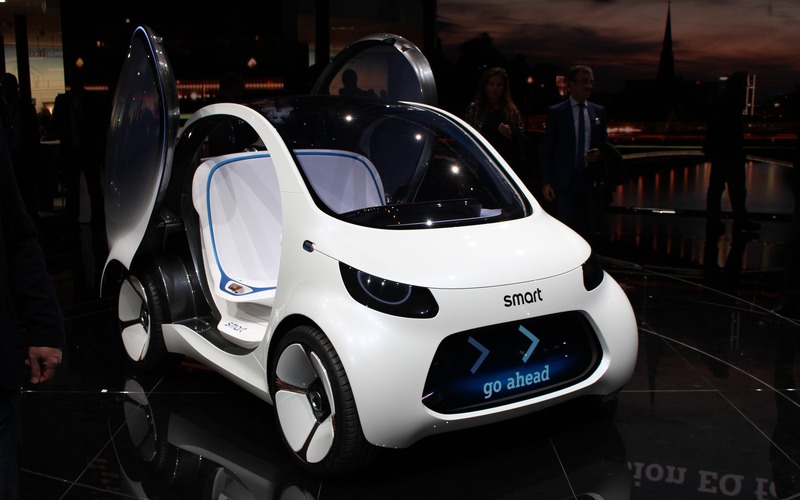 The Car GuideAuto ShowsFrankfurtsmart vision EQ fortwo: Urban Mobility of the Future? smart vision EQ fortwo: Urban Mobility of the Future? FRANKFURT, Germany – Mercedes-Benz is announcing their idea of the future of mobility with the smart vision EQ fortwo, which was unveiled on the Internet before making its first public appearance at this year’s Frankfurt Auto Show. The vision EQ fortwo combines connectivity, autonomous driving, car sharing and electrification, which are all part of the company’s CASE corporate strategy. The smart brand is also associated with car2go, Mercedes-Benz’s car-sharing program that’s implemented in many major cities around the world, including in Canada—Calgary, Montreal, Toronto and Vancouver. However, the smart vision EQ fortwo takes the idea of car sharing to the next level. Once a user summons a vehicle using a mobile device, this fully autonomous smart will “find” the person, and the latter will recognise their vehicle thanks to a fully digital black panel up front that identifies it. This panel can also be used to communicate with other road users, such as telling pedestrians that they can cross the street in front of the car. The vehicle drives the occupants to their programmed destination, and there is no steering wheel or pedals in the cockpit. The vision EQ fortwo can accommodate two passengers on its white simulated leather bench seat, and if only one person is occupying it, it will be possible to share the ride and the costs with another user—or not, if we don’t like being in a car with complete strangers. Inside, there’s a large display which occupants can connect their mobile devices to. The car is equipped with a 30-kWh battery pack—which would provide a driving range we estimate at about 150 to 200 km—and when no one’s on board, it will find a charging station on its own. It can also send electricity back into the power grid. With the smart vision EQ fortwo, the company expects parking spaces to free up, as this type of vehicle service is always in motion, and that the current car2go fleet could be reduced as well with changing needs. No offcial date has been announced as to when such a vehicle would hit the streets, but the manufacturer is hinting at 2030.